Home » Book Releases » UPCOMING RELEASES FROM CAVERN OF DREAMS PUBLISHING! UPCOMING RELEASES FROM CAVERN OF DREAMS PUBLISHING! 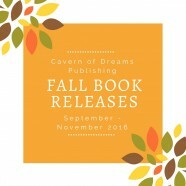 Autumn is an exciting time at Cavern of Dreams Publishing! We have many must-read new releases coming out – just in time for Christmas! September will see the release of Go To Sleep, Leona!, the first children’s book from Brantford author Amanda Morrison. Based on her own two children at bedtime, Leona and Halia, this adorable picture book, written in both english and french, is sure to become a bedtime favourite! Regina Jetleb, author of the popular preteen novel What About Hailey? will be releasing her second YA novel, The Girl in The Mall. Based in Toronto, Ontario, Canada, in the famed Eaton Centre mall, The Girl in The Mall highlights the issues of alcoholism, teen homelessness, and bullying. Told first-person by main characters 15-year-old Andi and Noah, the story is touching and real. The book also features a handy resource page of contacts for readers who may need help in their own lives. This novel will make a great addition to any preteen or teen’s book collection, as well as classrooms and school libraries! Curtis the Crock is the newest instalment in Mary M. Cushnie-Mansour’s bilingual Colour Me!/Coloriez-moi! Just Imagine Children’s Stories/Histoires d’enfants book series. Curtis the Crock is sure to delight young readers with fun colouring pages, and parents as well, with it’s interactive questions and activity pages! Check out other titles in the series HERE! This collection makes a great gift for children starting their French Immersion journey in school, and for primary classrooms whose teachers are looking for fun ways to engage their students! Mary M. Cushnie-Mansour will also be releasing her new book of poetry, Picking Up The Pieces. This poetry anthology focuses on women’s issues and empowerment; it is a must-read if you are looking for inspiration and thought-provoking poetry pieces. This book will make a great gift for any woman in your life! Nonna’s Chair is the second children’s release from Cavern of Dreams Publishing author Mirella van der Zyl. You can find her other book, Silva’s Journey, HERE! October will see the official release of the second instalment of N.W. Young’s epic 2-book love story, The Summer Garden and The Song: Harvest. Harvest picks up where The Summer Garden and the Song: The Circle of Life left off: after enduring heartbreaking tragedy, Mick has no choice but to push on. And despite his despair, Mick’s summer, and the inevitable harvest that follows, hold promise that the Circle of Life will continue. The Summer Garden and The Song: Harvest is currently available HERE for pre-orders. November will see the release of the much-anticipated Patches the Penguin by Scott Kovack. Patches is an adorable children’s picture book about a penguin who wants to fly. This is Scott’s first book, but not his last; he is currently working on other titles! Patches is perfect snow-day reading; make sure you get a copy for the little ones in your life! Also coming in November is Alexandra’s Christmas Surprise, the final release in 2016 in the Colour Me!/Coloriez-moi! Just Imagine Children’s Stories/Histoires d’enfants series by Mary M. Cushnie-Mansour. This fun, bilingual colouring storybook will make a wonderful addition to any child’s Christmas book collection! You can get the other titles in the series, as well as Mary’s other children/YA titles, HERE. With so many great releases, we are going to be celebrating! Make sure you keep an eye out for our events, fundraisers, and monthly book promotions in all genres – only from Cavern of Dreams Publishing! Happy Autumn, everyone!